David Lynch's Mulholland Drive began life as a TV pilot for ABC, the same network which aired Twin Peaks - Lynch's greatest mainstream success. It would be interesting to see how each show would fare in today's television landscape, one where serialized shows like Lost have succeeded, in part because ratings expectations are much lower and cable's serials lead the pack in competing for viewers' attention. In any case, the TV network was not ready for a mysterious drama set in Los Angeles where the central MacGuffin was two women's search for one's forgotten identity. So Lynch did something similar to what he did for the European theatrical release of the Twin Peaks pilot. He fashioned a lengthy ending, tying up the open-ended plotline, and got the rights to release the film theatrically. Naomi Watts plays Betty, a stereotypical Midwestern woman who moves to Hollywood to become an actress. Naive and overeager, she is determined to prove herself in the corrupt industry town. Meanwhile, a woman receives a head injury in a car accident on Mulholland Drive. Dazed, she finds her way into the apartment that Betty is moving into. Betty runs across the enigmatic accident victim in her very own shower, a woman struggling to remember her identity who starts calling herself Rita (Laura Elena Harring) after spotting a poster of Gilda in Betty's apartment. Subplots and seemingly unrelated characters intrude on the central plot. No doubt these were to be coherent subplots on the prospective TV series. One such storyline involves rising movie director, Adam Kesher (Justin Theroux), whose luck turns for the worse after being threatened by two heavies seeking to cast one Camilla Rhodes (Melissa George) as the star of his next picture. These plots would have continued and tied in to the main story had Mulholland Drive gone to series. 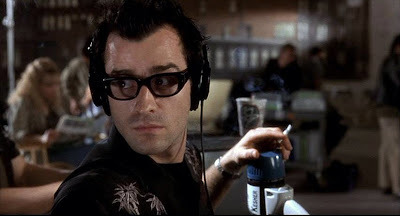 Instead, Lynch uses them to fold the movie in on itself, tying Camilla and Adam to Rita in the film's climax, bringing up questions of identity and reality versus surreality, themes that recur often within Lynch's work, but are distilled here to their purest form. One can almost see the invisible line that Lynch draws at the point where Mulholland Drive departs from its relatively conventional TV origins to the surreal realm in which he frequently wanders. It is about an hour and a half in when the movie metamorphoses from a neo-noir Nancy Drew to a haunting exploration of the obsessive ardor Diane Selwyn (Naomi Watts again) feels for Camilla Rhodes (Laura Elena Harring again). Diane awakes into a nightmare of a life, as if the first part of the film was a desperate dream formed by her fragile mind to put things right in her sad existence. Whereas Betty and Rita make love after bonding over the mystery of Rita's identity, Camilla rebuffs Diane, choosing director Adam instead. The promise Betty displayed as an actress in the first part has evaporated, with Adam giving the lead role in his film to Camilla rather than Diane. Identities transmute into new ones. The real merges with the surreal in the most necessary way yet for a Lynch film. The director even finds moments to comment on the part he plays as a master of ceremonies in these proceedings, as evoked by the stage magician that helps usher in the tonal shift at the point of departure in the film. 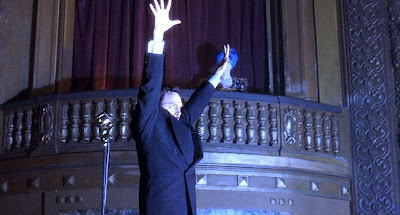 Consciously or not, Lynch refers to other works of his including those that have yet to be: once, when he enlists Rebekah Del Rio to sing her version of Orbison's "Crying" (Blue Velvet's iconic scene where Dean Stockwell mimes to Orbison's "In Dreams"); once again, when the electrical surges of the magic show help to transmogrify Betty into Diane (Lost Highway, Twin Peaks); and finally, when the actress' descent into madness foreshadows the insanity of Nikki Grace (Laura Dern) in Inland Empire (2006). Mulholland Drive is the apotheosis of Lynch's filmography, transcending its humble TV beginnings to become one of the best films of the decade. This post was first published at Film for the Soul for its continuing series on the best movies of the 2000s, Counting Down the Zeroes, on 5/17/09. This is a nice post and looks at MD from a perspective I haven't read before. Considering general bafflement about the movie in reviews, I'm glad to see your (always) smart approach to criticism. At the same time, I wonder how much you can really speculate that the show would have been much more clear cut. Unlike the pilot for Twin Peaks, the MD pilot is just as baffling and doesn't really offer much set up for anything that isn't in the movie. I'm sure the end product would have gone a little deeper, but I don't think the answers would have all been there, especially if the ending were to remain the same. For all the people who think LOST is confusing, I think MD would have just been nuts. But, of course, this is all speculation. Hard to say much definitively about what could have been, but its still fun to think about that under the lens of what we have in the movie as you do here. Nice work! I never thought of MD as a pilot for a series, but it certainly makes sense. I do agree that the series would have struck mainstream American as "just plain nuts," but would have gotten phenomenal reviews from the likes of Rolling Stone, Newsweek, and Time. If one remembers, Newsweek had a fairly lengthy and favorable article on Twin Peaks prior to the launch. The series obviously would have had to been on HBO or Showtime. A nice introduction of each episode reminiscent of Alfred Hitchcock Presents would have been a nice touch. Thank you for a completely credible thought piece. 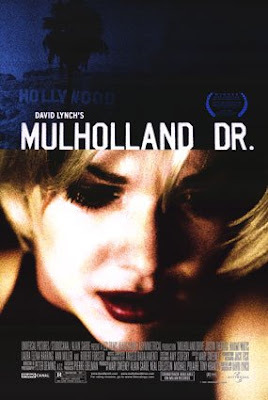 I will the bite the bullet and say that, as fun as it would be to explore the world of Mulholland Drive for several seasons, the movie is most likely better than the TV show would have been. Particularly if the series would not have ended the same way as the film. Excellent overview; as always, your focus on context is illuminating. I agree that this works better as a film. In addition to liking the ending Lynch fashioned for MD much more than the ending for the Euro-theatrical version of TP, it seems to deepen MD. What I meant to say is that had this gone to series, then characters that appear briefly would have made more sense, been more directly tied into the action concerning the protagonists, etc. I'm thinking of folks like Robert Forster, Lee Grant, and the like. who appeared briefly, but seemed to be cast with the hopes of further exploration down the road, a la the Log Lady in TP. I highly doubt that much of the denouement as it exists now would have played into the series at all. Thanks for the praise. It's much appreciated. Funny, isn't it, how one of the oldest cliches in the book ("It's all a dream") actually turns out to enrich and deepen Mulholland Drive (much the same as its subject matter, a potential E! True Hollywood Story when looked at from a distance is treated with exceptional poignancy and depth so that it is amplified to the level of tragedy). Of course, the film's detractors (and they are legion) will use both of these points against MD, but to my mind they are indications of its genius. I put this one on a recent Top 5 of mine (I've been going through the decade year by year)...and would have included it on there for that achingly beautiful "silencio" scene alone.